I’ll expand a little to say that you’ll want the ball sit down when in the rough.I had more than a few sitting up, and a couple sitting down, and down was way easier. In flop shots, which you’ll have to hit a bunch of, when the ball is sitting up a little, you’re stuck having to deal with the possibility of the club sliding completely under the ball and leaving it short and still in the rough. For me, I’m stuck always making sure I get it on the green cause I’ll take a 20 footer every time over the chance of leaving it short. When the ball is sitting down you can open the club and swing hard and through and understand way better the type of contact you’ll have. That’s way better than having to somewhat guess about the contact. 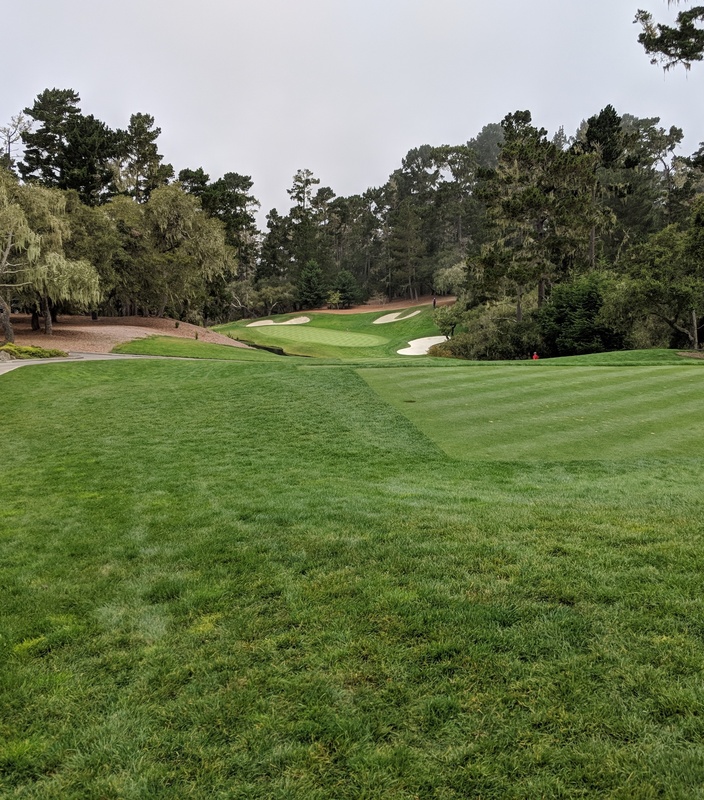 This could cause some controversy too, but Spyglass is a better tournament course. For tournaments, I want giant score distribution, where if a players is playing well, they can shoot under par, and if a player is playing badly (me) they shoot more over par. Look at the scoring averages and for the two courses and you’ll see they both averaged the same ~+4.3, but Spyglass had more birdies, more bogeys, and fewer pars. Figured since the talk about putting relates to both courses, it gets its own section. Greens were rolling good at both courses even given the amount of Poa Annua, and equally impressive how well Pebble’s greens are kept from being destroyed due to the amount of play they get every single day. Noteworthy though is how different the Pebble greens were in the afternoon. In the Midwest we can see the difference in growth rates of bent and poa grass, but this difference was much more obvious at Pebble. In the afternoon practice round, I felt more bounce than in the morning of the first round. Granted, I easily could have just gotten used to expecting the bumps. As bad as I hit the ball, I putted the complete opposite. I made every putt inside ten feet, and more than a few outside ten, usually for par, or sometimes doubles. All were perfect putts, where the only putt that I lipped in was a five footer on the second hole at Pebble for a sand save. If I didn’t made those putts, I’d have shot in the mid 80s for sure. StrakaLine books, which I got from an unnamed source, were very interesting. I looked at them during the practice round and didn’t put much into them, and then a few times in the tournament for a few seconds. The one case I think I could use it is to try to determine the amount of break at the end of the putt, and whether it matches up with the overall break. In each example, the book would only confirm what I saw myself with the specific numbers having nothing to do with it at all. Notable example is number 7 at Pebble. The pin was 12 on 5 from the right, and I hit my wedge behind the pin. The big question was how much the putt would break at the end. Check the book and you’ll see that the ball rolls slightly towards the ocean, and then straight, or even opposite. Checking to see that the ball wasn’t falling off the green towards the water helped me confirm what I was reading, that I shouldn’t play the ball to break more at the end. With that being said, I’m looking at the book here and still can’t tell exactly where the hole was. Is it exactly 5 from the edge of the green? 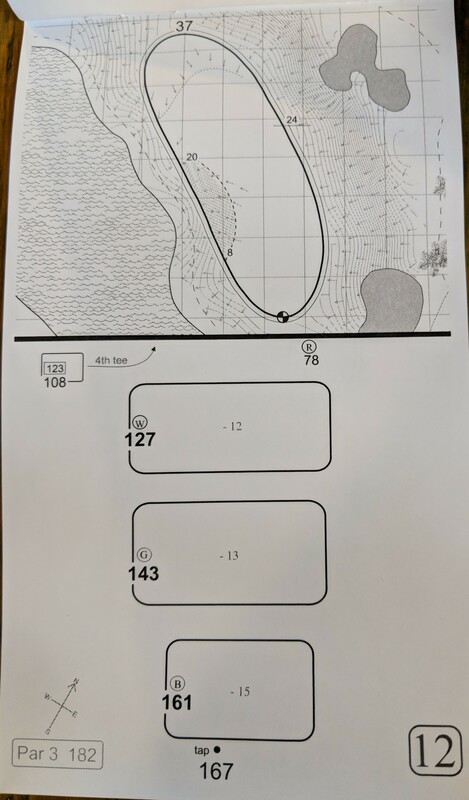 The arrows around that location are a little sporadic, so what good would seeing those arrows tell me exactly how much break to play the putt? In this case, the book didn’t really help me since I knew what it was going to do and I always trust my reads. In no way did they slow down play. The few times we used them was to take a brief look to see if the first part and last five feet matched up in break, and we took no more than a few seconds to do that after reading the putt as I normally would in the first place, where this was all done while others in the group were reading their putts before me. Also interesting, during the registration, the USGA had a desk asking if the players wanted to purchase the green reading books- the StrakaLine and then a similar one. The guy and caddie / father in front of me wanted to buy the non-Straka books and they cost 70 dollars. 70 bucks for two of them. Odd that they have those in the registration room, and odd that they cost that much to use. 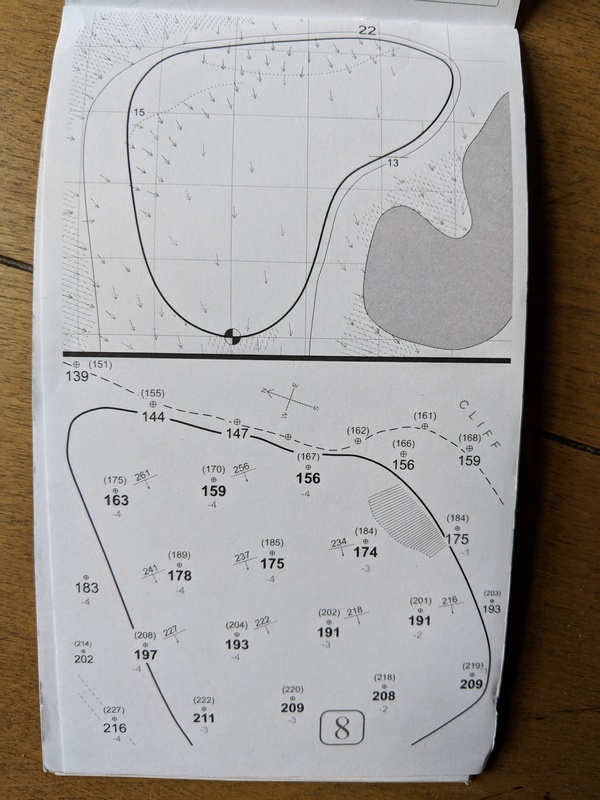 On the topic of yardage books, the general ones the USGA provides sure are great. 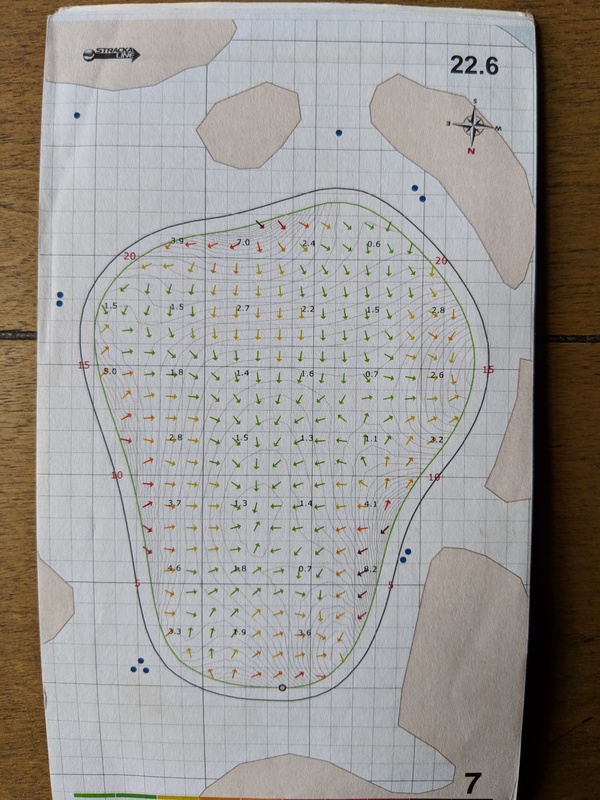 A “normal” yardage book, like the ones you can buy at most courses for 10 bucks, will have pretty graphics, short descriptions and “stories” of the holes, and some random yardages to lips of bunkers. The USGA books provide much more information. For every sprinkler head, they list in bold the yardage to the front of the green since that’s more important than the middle of the green. They also list the yardage difference due to elevation changes, which is huge. Perfect example, the famous par 3 12th at Spyglass. 198 downhill, drop of 15. Playing 172 to the pin, which is just about the standard 8 iron. Completely trustworthy where I hit a good shot (finally) to 6 feet little left and slightly more than pin high. Without that information, how in the world are you supposed to know and trust what club to hit? Are you going to guess the shot is ~15 yards downhill? For us, the pin was +5, so it was 187 to the pin, minus 15 yards, was playing 172, which was a standard 8 iron that I hit to 6 feet and made for birdie. No chance without knowing the downhill yardage number. If we’re mentioning downhill par 3s, what about #3 at Spyglass? Played, 172 yards to the middle, but 21 yards downhill. Yup, 21 yards, which was a little off a 9 iron that I stuck pin high slightly to the right. And hey, let’s keep going! What about #7 at Pebble that’s apparently -9 downhill, or number 8, which is only -4 yards downhill from the fairway. When you look at the approach shot picture on 8, it looks way more downhill than the number tells you. Talk about helpful. Check out the picture in the picture tweet from Pebble. And you can trust me that it looks way more downhill. It’s nuts how much having the slope information helps, and I already have ordered an elevation range finder with the option to disable the info for competition rounds. I’ll make sure to go through in practice rounds and write down all that information beforehand. One of the objections to the elevation yardage numbers is how accurate it is with different ball flights. I hit the ball lower than most, so does that mean I’ll be different than an already mentioned Jason Day who has ridiculous shot elevation? I’ll say not much. Frankly, people thinking they know how far they hit the ball down to the half yard are lying, even if they TrackMan it up all the time. 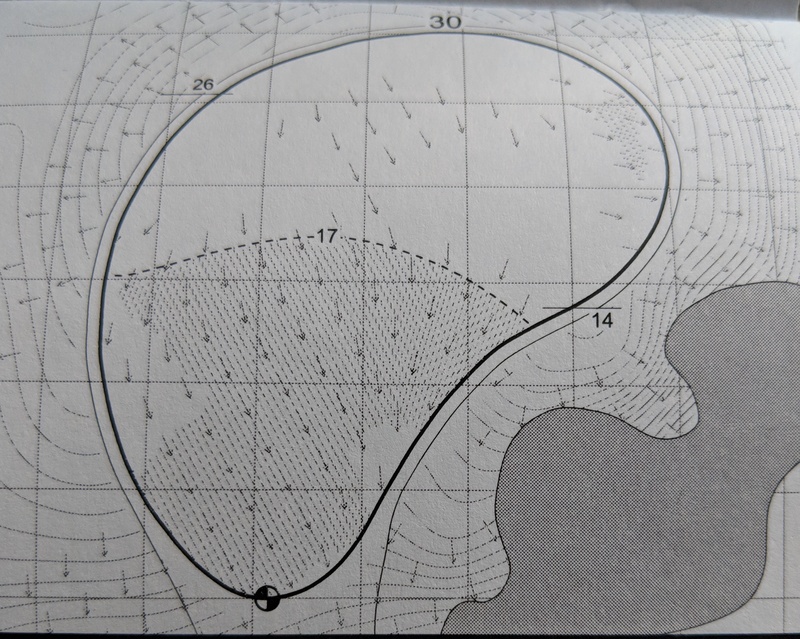 Should we be allowed to use range finders with slope yardage information? Right now, no. It’s the same issue as to why range finders weren’t legal right away, because everyone would have to spend the hundreds of dollars on a new slope range finder. If the USGA gives that information in the books, then the time’ll come where they allow it. In the meantime, I’ll want to get one for practice rounds and write down the numbers. Totally worth it. I’ll say it straight up — the weather wasn’t that great. Nothing above 65, one sunny day during the afternoon practice round at Pebble. All pants all the time. Though it was still warm enough that I didn’t need a jumper, which is what all the Australians I played with called a jacket. 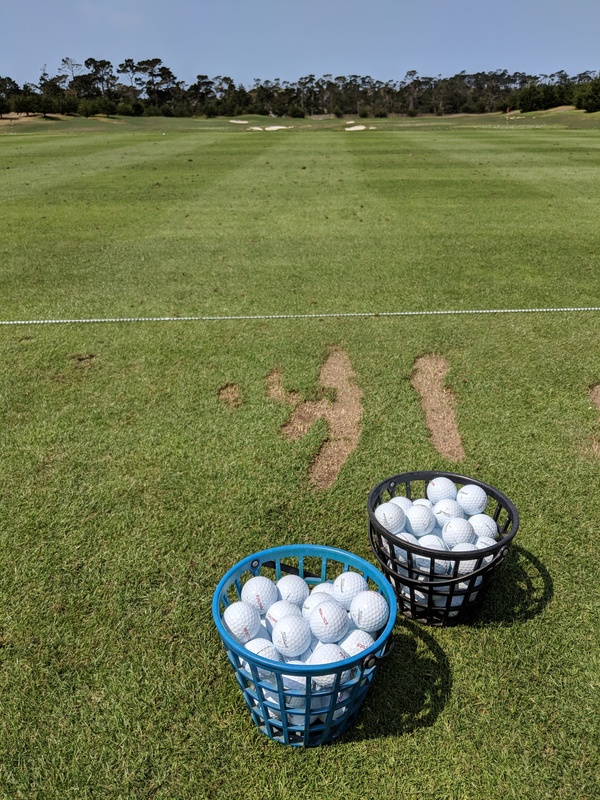 New practice area nearby that was redone in 2013 has a smallish putting green, two chip / pitch areas, and a range with some of the best turf I’ve hit on in a long time. I don’t take great divots, but those I hit on the range sure looked pretty. I’ll now use this time to complain about how people treated the pitch areas that I didn’t take a picture of. There were baskets of the pro v1s, and all anybody did was grab a few, whack them on the greens, get a few more, whack those on the greens, and then leave. I would spend half the time trying to clean off the greens to at least get a sense of how the shots released and where they would end up. In all fairness, there was so little space there and so many people with a desire to hit 40 yard shots into practice greens that it would have been hard for everyone to clean up. But still, people, don’t use shag bags on a chipping green, and make sure to clean up after yourself. 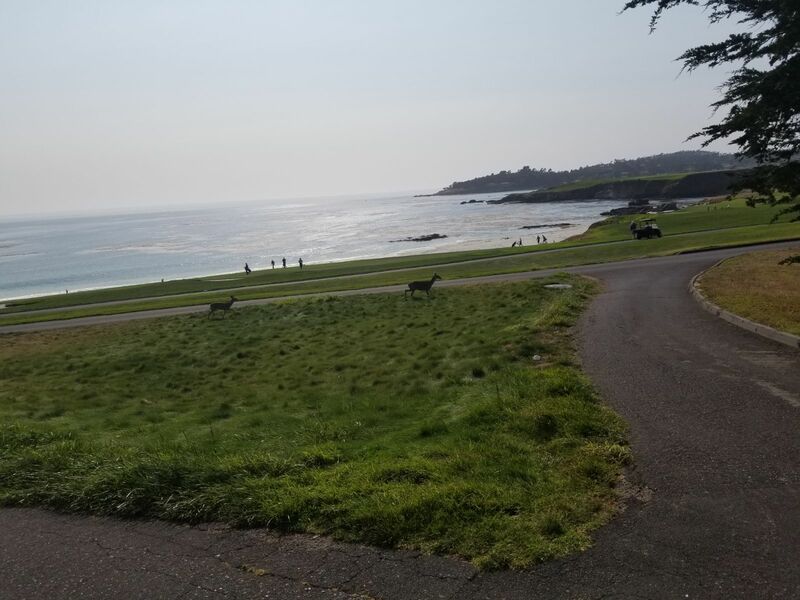 There sure are plenty of deer in the Monterey area, to the point where you’ll probably see the same few on the 2nd hole at Pebble every time you play. My mom loved taking pictures of those guys, so here’s a picture standing on 11 looking back to 10, 9, 8, and 7. I was also told that since the deer love the Monterey area and don’t migrate or check out new land, they kind of inbreed somewhat making a bunch of them funky looking. Little creepy to mention, but figured I should so you don’t get too confused by the odd looks. 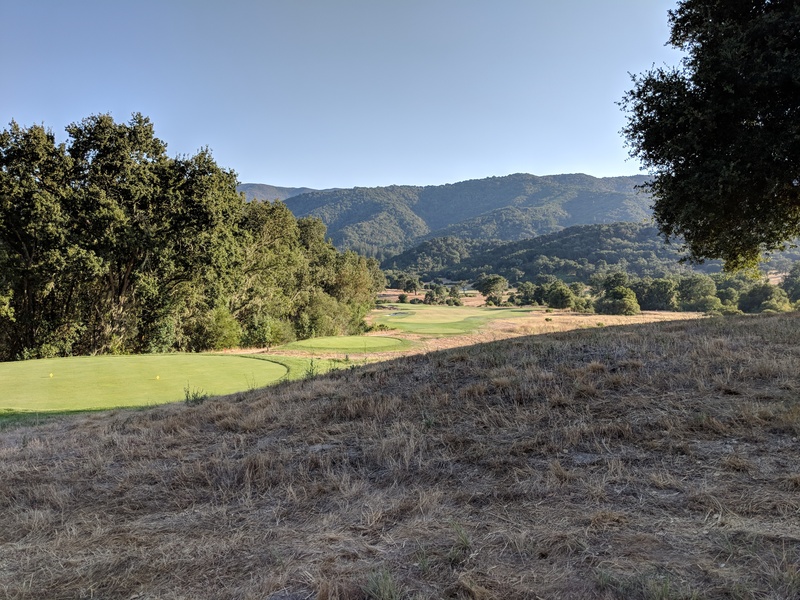 I was lucky to be able to check out The Preserve. It’s this private, giant landscape over the mountains a little south and east of Monterey. First hole, down the hill, looks pretty pretty doesn’t it? 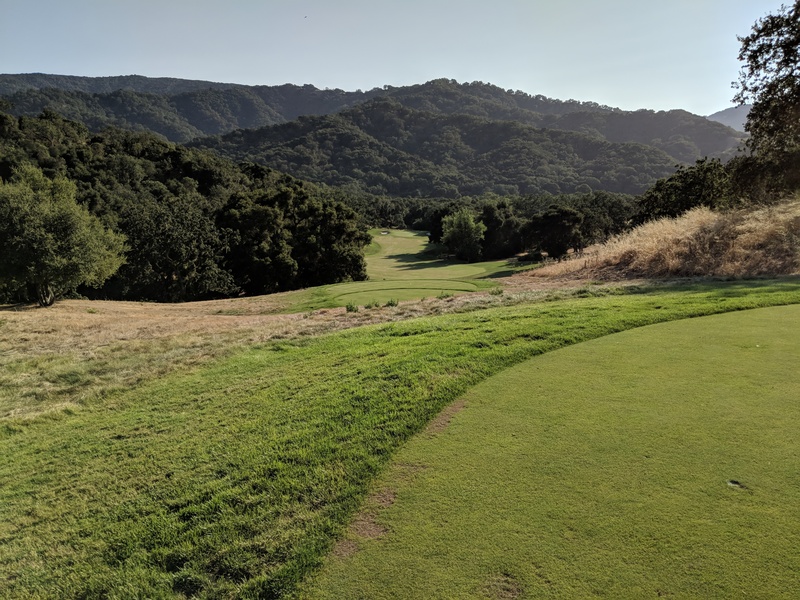 It’s the type of course that’s fitted so nicely into the terrain, and a course with plenty of trouble off the fairways where I’m sure I’d lose a crap ton of golf balls with big misses. But I’d still want to play there all the time. Screw the fog, screw the cold. I want to get back there and play. One more pic for good measure. Though it’s too hard to pick which pictures to post. I’ll end this post by talking about something a little different than normal golf talk, and start by saying that I’m terrible at starting tournaments. My first shot in my first USGA at the 2005 US Junior as a 14 year old was snapped into the street and out of bounds. In the 2011 Pub Links at Bandon, I was +5 through 3 holes (finished the 36 at +6 and even won two matches). At the 2017 Four Ball at Pinehurst, I pulled a three wood on the first hole of Pinehurst #2 that stayed barely in bounds next to the road (where I made an easy par because I had this nice window in the trees that I could hit it through). In last year’s US Am, I was in the first group off #1 at Riv, which meant I was in the live Facebook stream the USGA does. The night before I was reminded this was coming, and I was on the practice green ~15 minutes before the tee time and saw a guy come out with a camera and another with a microphone. The video, seen here, now has over 146k views. All I wanted to do was keep it in play, which I luckily did. Starting on the 10th hole at Pebble was no different. Driver in the ocean, 6 iron in the ocean after the drop. I can go on about how I’m awful at starting rounds, but I’ll stop here. If you want to hear more about me starting rounds like garbage, I know I can come up with more. There are other cases where it’s not the best to follow what Tiger has done, but his attitude on a golf course is one to follow. There are plenty of examples where Tiger doesn’t start his opening round off well, but we always see him grind and recover. In the PGA Championship this year, Tiger was +3 after 7 in his first round. He finished that round at even and the tournament, as everyone knows, in solo second at -14. In fact, Tiger’s ranked 135th in round one scoring average, but 10th overall. Too many times in the past I’ve given up after starting and not playing as good as I felt I should, but this time I made sure it was different. That 10th hole, I had 50 yards as my 5th shot. I hit it to 8 feet and made that putt (cause I made every putt). 14, I made a 20 footer for double as well from the famous front left bunker after hitting a lay up shot ob since I couldn’t keep 5 irons in play. On the par 3 5th, I ended up making another 20 footer for double as well after hitting my first shot on the beach, because I apparently can’t keep 7 irons in play either. I finished poorly, still, that doesn’t mean I’m not happy with my attitude. Don’t stop trying on the course, even when you’re looking forward to being able to finish.